Take note my fellow Americans, before it’s too late! The next time someone talks in favor of gun control, please remind him of this history lesson. Note: Admiral Yamamoto who crafted the attack on Pearl Harbor had attended Harvard U 1919-1921 & was Naval Attache to the U. S. 1925-28. Most of our Navy was destroyed at Pearl Harbor & our Army had been deprived of funding & was ill prepared to defend the country. It was reported that when asked why Japan did not follow up the Pearl Harbor attack with an invasion of the U. S. Mainland, his reply was that he had lived in the U. S. & knew that almost all households had guns. Do you naively believe that the government will protect your rights? Do you naively believe the police will arrive at your home in time to prevent crimes of violence or other criminal acts? The government has thousands of gun laws on the books and most of the states individually have thousands more. At last count there were over 25,000 laws on gun control collectively throughout the United States. Which one of those thousands has stopped criminal activity? Can you point one out for me? The left reminds us of our freedom of speech rights at every opportunity, yet believe that gun control is needed to stop crime and that the 2nd Amendment doesn’t apply in this day and age. Freedom of speech is great for all of us living here in the U.S. 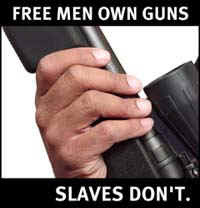 So is the right to own firearms, guaranteed by the 2nd Amendment. But I have to ask, how long do you think your 1st Amendment rights will last if every law abiding citizen in this country has their 2nd Amendment rights revoked and are forced to turn in their guns or risk becoming criminals? And as “Subjects” we are at the mercy of government or any despot seeking control over us. Defend your rights before they are gone.